Mother of Mothers, Andre Lambertson & Kwame Dawes (US/Haiti):This visual poem celebrates the strength that many Haitian mothers have displayed in the wake of the devastating 2010 earthquake. Mr. Mom, Zsuzsanna Geller-Varga (Hungary): This documentary follows a family in Hungary where the father stays home as caretaker and the mother is the primary breadwinner. Birthmarkings, Margaret Lazarus (US): Margaret Lazarus’ film “BirthMarkings” explores our post birth bodies—and how our self-image—change after giving birth. Born in Bangladesh, Chantal Anderson (US/India): This photo essay shows the mothers and children of Bangladesh, where extreme poverty reigns but maternal health has improved in recent years. Protective Custody: Within a Prison Nursery, Cheryl Hanna-Truscott (US): This photo series looks at a unique option offered by Washington State, USA to imprisoned mothers and their children. 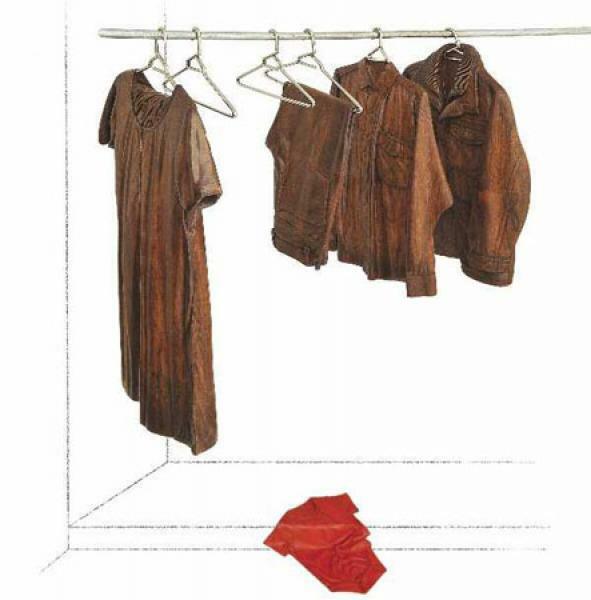 Breakdown in the Closet, Humaira Abid (US/Pakistan): Humaira Abid depicts the pain and disappointment that comes along with miscarriage in her intricate wooden sculptures. Each of these stories represents an important, and unique, aspect of motherhood around the globe. I voted for Birthmarkings because it explores self-image and how our bodies change after we have children. Some women feel self-conscious and unattractive. I never felt unattractive because of my husband. He always made me feel beautiful. My self-image after birth has not changed. My changed body is a reminder for me of how blessed I am to be a mother. The winner of this competition is Humaira Abid’s Breakdown in the Closet. What a concept. Six wooden hangers in a closet–two of them bare. These two hangers depict the pain and disappointment that comes along with miscarriage—a frequently unspoken part of many women’s experiences of pregnancy and motherhood. The clothes look so real. It’s hard to believe that they are made of wood. We see the mother’s dress and the father’s pants and shirts. This is a family wardrobe. A husband and wife are expecting a child but tragedy strikes. On the floor between the mother’s and the father’s clothes, we notice something that stands out in sharp contrast–the red baby shirt. This is meant to represent the mother’s miscarriage and both parents’ loss. Humaira explains that this work is a part of a series called “RED” named such because the color red represents love, passion, blood, anger, and loss–all strong emotions. Yes in the subcontinent, red is the traditional color of bridal dresses, and often is associated with love, sexuality, and fertility. Yet in some parts of Africa, red is a color of mourning and death-often associated with the color of blood. She herself suffered from miscarriages so she knows how tough this can take both a physical and emotional toll on women. As the winner, Humaira Abid receives a US$1,000 prize, with $500 going to the artist and $500 going to a nonprofit charity of her choice! Notes to Women congratulate this amazing artist who uses her work to a very painful experience for women. Unfortunately miscarriage is very common, occurring in about one in five pregnancies. Some women feel a strong sense of guilt, even though it is not their fault. These are natural reactions. Breakdown in the Closet brilliantly and skillfully addresses a topic that is very difficult for women. Humaira’s work recognized internationally for its originality and excellence has earned her a gold medal. Her work has been exhibited in Malaysia, India, Mauritius, Nepal, Kenya, Dubai, Bolivia, Germany, Russia, UK and USA. Humaira graduated from National College of Arts Lahore, Pakistan with Honors in the year 2000. She majored in Sculpture, with Miniature as her double minor. We salute this internationally renown artist who uses her art to take action against the issue of gender inequality. Brava Humaira. We are pleased to announce that last month Humaira had her first child. Congratulations, Humaira. We wish mother and baby all the best. I am from a country and society where showing your emotions and expressing your opinion is not welcomed–especially if you are a woman. Many experiences and roles of women are not properly appreciated. They are simply considered to be their duty or part of life. I am trying to raise these issues through my work, which counters the stereotypical image of women in a male dominated society. In an environment where women have a considerable way to go to become full partners of men, I want my work to reflect the aspiration for gender equality.